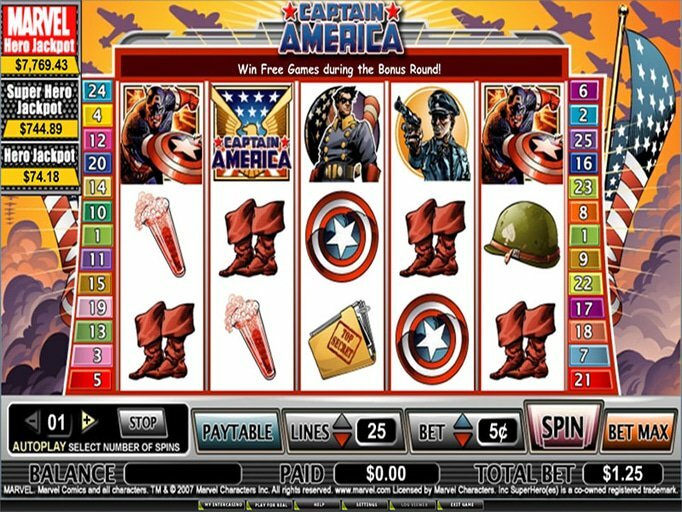 Marvel Comics have been coming to life in online casinos for several years now, but only Playtech has captured the true-to-life spirit with the Captain America slot machine. The theme here represents the comic more than the cartoon or the movie, and this is evident with the dusky background featuring an American flag to the right of the reels. Some of the icons you'll see include the Flag, Secret Files, the Star, the Statue of Liberty and much more. There is not only an in-game jackpot worth up to $62,500, but there's also a significant progressive jackpot that is tiered for all budgets. Getting started is a breeze thanks to the easy-to-use controls that are situated at the bottom of the reels. You can choose coin denominations that start out at just a penny and climb to $5, and this means that the betting range is $0.01 to $125 - wide enough to fit most budgets. The 'big win' for the progressive at the time of writing was over $33,000 and this jackpot is tied in with all of the Marvel slots across the Playtech network and is tiered so that even those who choose penny wagers have a shot at a portion of it. The wild here is Captain America himself and it can act as any other icon on the screen with the exception of the scatter. It will allow you to achieve more winning combinations in this manner. The scatter, then, is the Star Logo and with three of these, you'll be able to participate in the bonus round. Here, you'll need to bring down at least five planes with the assistance of your shield. You can not only earn some fabulous instant prizes here, but also some free spins that can go a long way toward boosting your bankroll. You can try this title out at Sports Interaction Casino where you'll get some Captain America free spins with no deposit necessary. If you choose to keep playing once you've used them up, you can also get a 100% deposit match of up to $100 to help you boost your bankroll. What's more, you can use these funds to enjoy this or any other fabulous Playtech title that is on offer at Sports Interaction.